For the past ten years or so, Design Inc have asked each and every member of their creative team to bring back a magnet from any holiday or trip they take and to try to build up a creative picture of success. 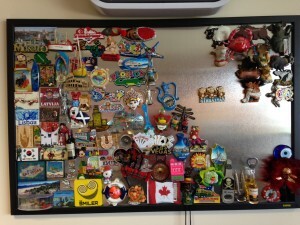 Everyone who has ever worked for Design Inc has been fully committed to this fun cause and, over the years, the magnet board has taken shape with it now being three quarters full of colours, shapes, styles, etc. The latest trip was by our studio manager, Jon who took a long weekend to Gibraltar (can you spot the Gibraltar magnet?). We have a little ceremony each time someone comes back from a trip. The traveller adds the magnet to the board and, hopefully, they have also brought back some sweets, biscuits or cakes to hand out too! It’s a small thing but it’s our thing. Engagement with our team is also achieved in so many other ways. From simple acknowledgement of staff birthdays, team drinks, meals, all the way through to dedicated team building exercises. Whatever options you choose for your business, the goal should always be the same – to establish ‘alignment’ in team thinking. Design Inc are very fortunate to have a very talented team who are all aligned and focused on the same goal: “success for our company can only be achieved by creating success for our clients“. The company was founded on this belief and it is just as true today as it was almost 20 years ago. Design Inc are a full service creative & marketing agency. If you would like more information on our services, team and our way of working, please contact our Client Services Director, Frank Norman. He would be delighted to hear from you.